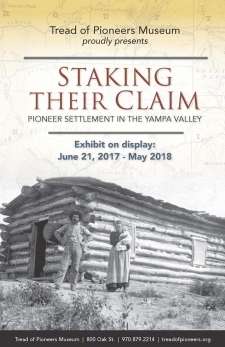 Honoring the deep connection between art and heritage in the Yampa Valley, the Tread of Pioneers Museum is proud to host seven local artists who through their artwork, pay tribute to the Yampa Valley and its remarkable history. 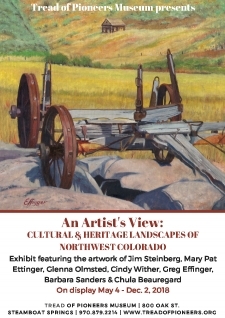 This mixed media exhibit reveals their individual styles and responses to this tapestry of our local landscape and culture. Catch the train! 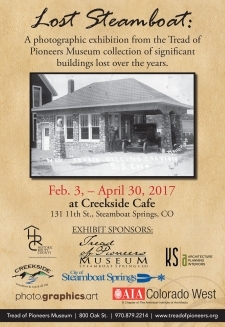 To help celebrate the Creative Caboose renovation project, the Tread of Pioneers Museum presents Cows, Coal, and Commerce: 109 Years of the Moffat Railroad in Steamboat Springs exhibit at the historic Depot Arts Center, home of the Steamboat Springs Arts Council. 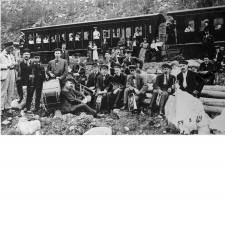 Utilizing historic photographs, personal accounts, and artifacts the exhibit outlines the various impacts of the railroad�s arrival in Steamboat Springs. 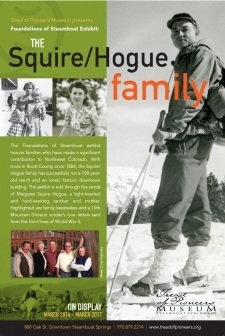 Respected, hard-working, giving--those words are often associated with the Hudspeth family of Steamboat Springs. As ranchers, teachers, and community club members, the family has been a staple of the community since 1913. 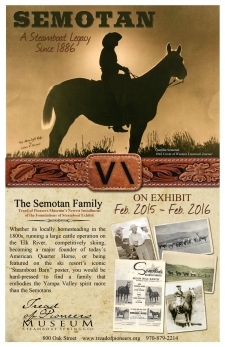 Today, Katherine Hudspeth Gourley and her children carry on her family�s one-hundred-year valley history. 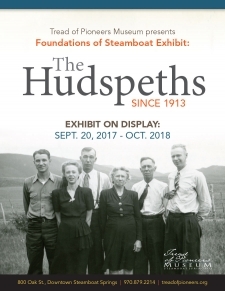 The Tread of Pioneers Museum is proud to honor the Hudspeth family in the Foundations of Steamboat exhibit series. Pioneers experienced extraordinary hardships and rewards making a life for themselves and their families in the Western frontier with no towns or amenities. In this exhibit, learn about the strength and courage of the early settlers who faced danger, starvation, privation, and loneliness in order to create a new life in the early West. These limited edition fine art prints created by Hawk, a renowned Western and wildlife watercolor artist, capture the mood, quality and simplistic lifestyle that is uniquely our local heritage. 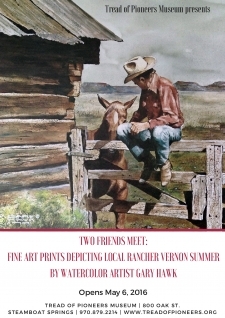 The prints were bequeathed to the Tread of Pioneers Museum by the Vernon Summer estate and feature Vernon Summer, the quintessential cowboy, working on his ranch in Sidney, just south of Steamboat Springs. 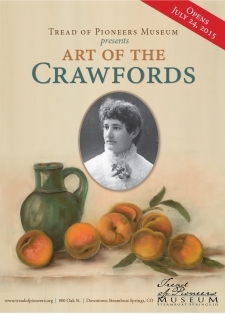 In 1873, the Crawford family loaded up their wagons in Sedalia, Missouri and headed to Colorado in search of a new life in the area that would eventually become Steamboat Springs. But how did they and other pioneer families do it? What were their routes? What did they eat? How did they survive sickness, inclement weather, wild animals, treacherous mountain passes with no roads and the grueling long hours? 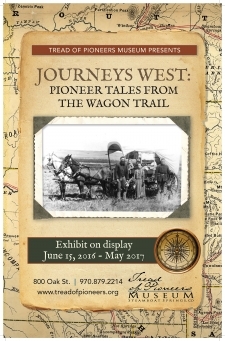 Drawing on diaries, personal memoirs, photographs and actual objects from Routt County�s first pioneer families, �Journeys West: Pioneer Tales from the Wagon Trail� explores what life was really like for these brave frontier adventurers. 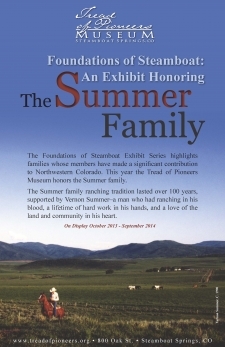 The Foundations of Steamboat exhibit honors families who have made a significant contribution to Northwest Colorado. 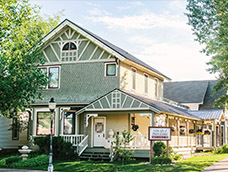 With roots in Routt County since 1884, the Squire/ Hogue family has successfully run a 100-year- old ranch and an iconic historic downtown building. 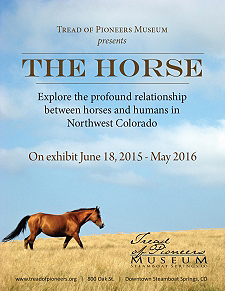 The exhibit is told through the words of Margaret Squire Hogue, a light-hearted and hard-working rancher and mother. 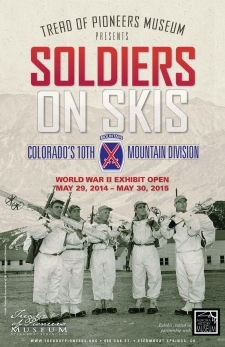 Highlighted are family keepsakes and a 10th Mountain Division soldier�s love letters sent from the front lines of World War II. When Norwegian ski jumper Carl Howelsen introduced recreational and competitive skiing and ski jumping to Steamboat Springs in 1913, he could have never imagined the skiing legacy that would follow. Known as the �Father of Skiing in Colorado,� in Steamboat Springs, Howelsen started the first ski club and Winter Carnival (both now over 100 years old) and built the first ski jump on a steep hill in downtown Steamboat Springs, now known as the Howelsen Hill Ski Area. 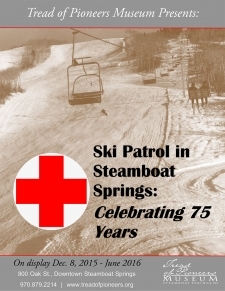 Howelsen�s influence would later transform Steamboat Springs into �Ski Town USA�,� a town now boasting more Olympic athletes than any other town in the nation. When you are on a great horse, you have the best seat you will ever have.� Winston Churchill From the Ute Indian�s first use of the horse in the 1630s to the modern Dude ranches of today, horses are a central part of our local history. Tread of Pioneers Musueum's Newest Installment of the Foundation of Steamboat Exhibit. 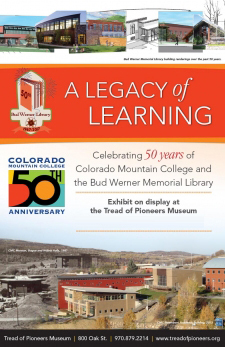 A photographic exhibition from the Tread of Pioneers Museum collection of significant buildings lost over the years. River rock, logs and quarry stone: the practical builders and architects of Routt County used locally available material to build Steamboat Springs� early stores, schools and churches. As a result, those buildings reflected history, geology, talent and Northwest Colorado style. 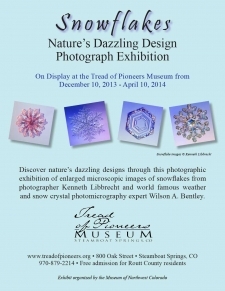 Discover nature�s dazzling designs through this photographic exhibition of enlarged microscopic images of snowflakes from photographer Kenneth Libbrecht and world famous weather and snow crystal photomicrography expert Wilson A. Bentley. The Foundations of Steamboat Exhibit Series highlights families whose members have made a significant contribution to Northwestern Colorado. This year the Tread of Pioneers Museum honors the Summer family. 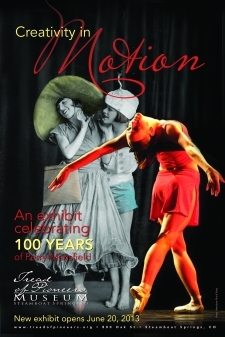 Perry-Mansfield Performing Arts School and Camp began in 1913. Located in a charming, rustic camp setting in Steamboat Springs� Strawberry Park, the camp is the longest continuously operating camp of its kind in the United States. Creative and educational programs in dance, theatre, art, music, writing, equestrian, and more, make it a unique haven for diverse artistic expression for students ages eight through college. Camp founders Charlotte Perry and Portia Mansfield had a tenacious and innovative vision. Their vision and camp are thriving today in its 100th year.